The motor yacht being offered by the Fratelli Rossi shipyard, called the "Colombo 24M", is a classic of its kind, with a round stern and soft lines. The shipyard has in mind principally those owners in search of an easy, comfortable boat, spacious enough to host up to ten people, plus a crew of two. The boat is built of steel, with lightweight superstructure, and CAD technique has been used for its design . "Colombo 24M" has been built meeting EEC regulations. It will be powered by two 400-HP Caterpillar engines, with which this motor yacht will be able to cruise uninterruptedly for more than five days, hence reducing the number of refuelling stops required. The sleeping arrangements consist of four large cabins, two of which are full-sized. The owner's cabin is in the stern, equipped with an office corner, private bathroom with separate toilet and plenty of space. Amidships, there are two other cabins, for guests, both with twin beds and private bathrooms. Forward, there is another double cabin, also very spacious and equipped with a private bathroom. Foremost, the crew quarters, with two berths (in a "V") and private bathroom. The crew quarters have independent access so not to interfere with the onboard life of the owner and guests. On the main deck, in the stern area of the superstructure, we find the saloon, equipped with two L-shaped sofas and coffee tables, armchair, cocktail cabinet and numerous accessories for relaxation. Still on this deck, amidships, the galley, with a small relaxation area for the crew astern. This deck is slightly raised and, thanks to its large windows, offers excellent visibility. Forward on the deck, we find the spacious dining area offering an appealing, panoramic view toward the prow. The fly is very spacious, with the tender stowed astern, positioned in a specially designed space and equipped with a davit. 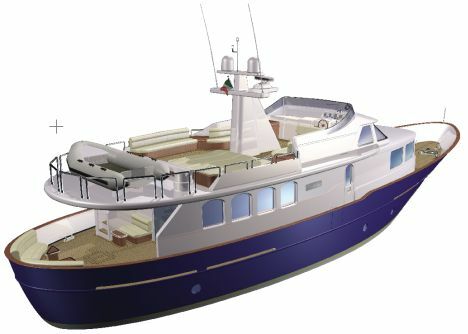 On the fly, towards the prow, there are two long sofas fore-and-aft, a large sundeck, cocktail cabinet, mast for the electronic-equipment aerials and, forward to starboard, the open-air control station with all of the steering-equipment repeaters. For those who love to be in the open air while sailing, the cockpit is the perfect spot, with its two sofas and coffee tables, and a stern extension of the fly, ensuring great comfort. A classic yacht that is, at the same time, very carefully thought-out, and in which the rounded shapes and intelligently arranged volumes create excellent spaces that serve well even during demanding cruises. Comfort and safety, hand-in-hand. For further information, please contact: Fratelli Rossi Cantiere Navale; Via dei Pioppi 4; 55049 Viareggio (LU); tel. : 0584 45833; fax: 0584 44385; Web site: www.cantierefratellirossi.it; e-mail: info@cantierefratellirossi.it.